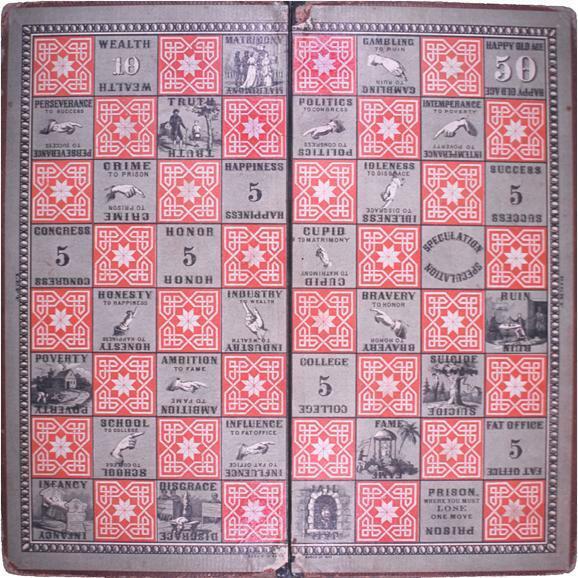 Milton Bradley “invented” the Checkered Game of Life in 1860 after dropping out of Harvard and going into business for himself. He bought a printing press. His first big venture was a lithograph of a clean-shaven Abraham Lincoln. When Honest Abe grew a beard, it didn’t sell. A friend invited Milton over one night for a board game to lift his spirits. He decided to print one up. 45,000 copies sold the first year. In the Checkered Game of Life, you start out in Infancy, and the first person to get to Happy Old Age with 100 points wins. Union soldiers took a pocket version into the battlefield with them during the Civil War. Happy Old Age looked pretty good on the battlefield. I do not know what Confederate soldiers played. Happy Old Age was worth 50 points. Getting there was half the game – the other half was how you got there. Avoid gambling, which leads to ruin; intemperance, which leads to poverty; idleness, which leads to disgrace; and crime, which leads to prison. You don’t get any points for those, and prison makes you lose a turn. Cupid will get you to Matrimony, but Matrimony doesn’t get you any points. Perseverence leads to success, and that’s worth five points; school leads to college, another five points; honesty leads to happiness, also worth five points; politics will lead you to Congress, five points; Influence leads to Fat Office, which is five points too; and a Government Contract leads to Wealth, which is worth ten points. The Government Contract square used to be a Speculation square, but that was a little too much like gambling. In the Checkered Game of Life, there is a square called Truth. Truth is not a destination, nor does it lead you anywhere. If you land on the Suicide square, you’re out of the game. Yeah. There’s a Suicide square. 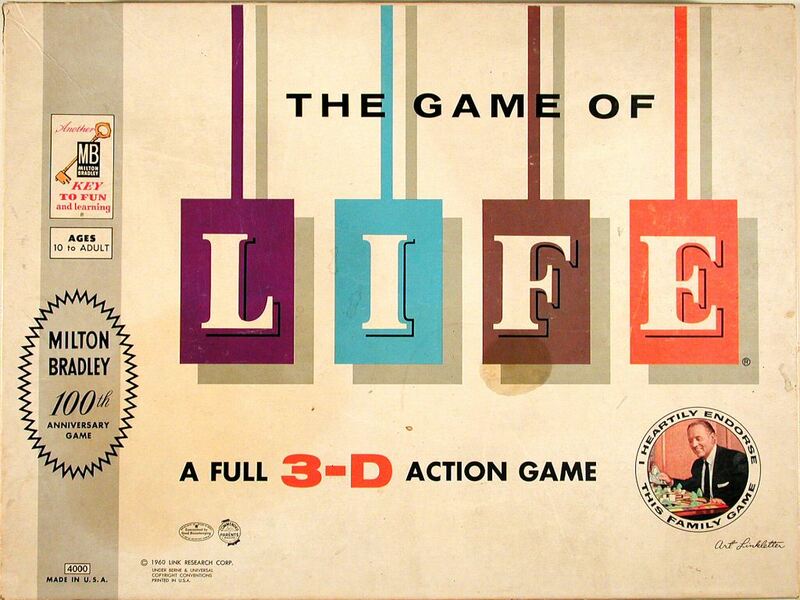 On the 100th anniversary of the Milton Bradley Company, The Game of Life was redesigned. That’s the one I played. You start out with a gender, a convertible, and $2500. Then you choose between business and college. College takes longer, but it is worth it, because you will always get paid more than a businessman, even if you don’t have a job. This might have surprised Milton Bradley. Getting Married gets you presents. Cash presents. When you land in one of the spaces where a child is born, you add a blue or pink peg to your car. Children don’t cost you anything, so have as many as you like. Every time you add a child you get to collect $500 from each of your opponents. “If you get more than four children just crowd them in as you do in real life.” Direct quote. On the Day of Reckoning – do not confuse this with Judgment Day – you cash in your insurance policies and stocks, and trade in your kids for money – each of them is worth $24,000 – and pay back all your promissory notes. No one cares whether you reach Happy Old Age. The destination is Millionaire Acres, and the player with the most money wins. In the Game of Life I played, bankruptcy was the worst thing that can happen to you. There was no Suicide square. There was no Truth square either. 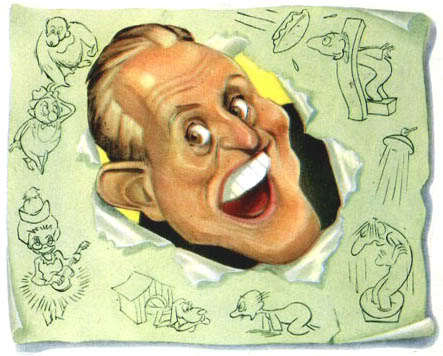 But there was Art Linkletter. Art Linkletter “heartily endorsed” the Game of Life. His signature was on all the money, and his picture was on the $100,000 bill. Milton Bradley’s picture was only on the $50,000 bill. But hey. Art Linkletter finished college. Didn’t use the degree because radio – and then TV – paid better, but he finished college. That trumped the fact that he worked here as an illegal immigrant until 1942. If you’re Canadian, and Art Linkletter, you can apparently pay a $500 fee and correct this. You can write your autobiography – Confessions of a Happy Man – at 48 and become a Disney Legend. You can have five children – “just crowd them in, as you do in real life” – land in Millionaire Acres and live to the Happy Old Age of 97 and a half, married to the same woman for almost 75 years. Milton Bradley would have liked Art Linkletter. If it hadn’t been for the child who landed on the Suicide square, and the child who landed on the Car Crash square, and the child who landed on the Cancer square – he’d probably tell you he won both games. Note: This post was influenced in particular by a marvelous lecture given by Jill Lepore of Harvard University which is available on YouTube. If you liked this post, you really need to give a look and a listen to Jill. Thanks for these awesome game facts! Don’t stop blogging. Looking forward to seeing more from you! Appreciate the compliment, Beth. Thanks for stopping by. Fascinating, Paula. I had no idea when we played The Game of Life – Simpsons edition (cringes..) of any of its history. Jill Lepore’s talk gives much pause for thought. Poignant given some of the conversations I’ve had this week – I think some of us only work out what life’s about when there isn’t necessarily time to play it properly. 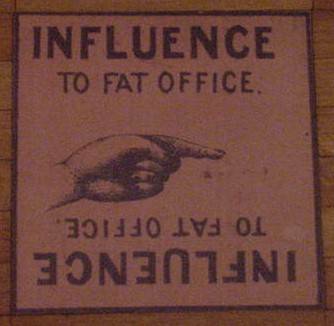 Busy now, for an ‘old’ post – clearly it was before its time ! My kids used to start off playing the board game and then start to make up their own stories about the cars and the little pink and blue pegs. I am inordinately proud of them for that. My office mate tells me that now pink pegs can marry pink pegs, and blue pegs, blue pegs. I wonder if they’ve figured out a way for the purpose of life to be measured in something other than $$$$$. What a fascinating post! I had no idea that Confederate soldiers played this board game. And the whole bit about Milton Bradley’s life. Good stuff! I’m gonna share this post on Twitter and FB, too, btw. I haven’t listend to the video, yet, but I will. Thanks so much, Tui! Coming from Unexpected Texas, that means a lot! Hope to get back to #StoryDam soon, but Thursdays seem to be just a little crazy. Are the conversations archived somewhere? I loved playing the Game of Life! Had no idea of its history beyond the gender pegs, cash and car. I always chose the college route as if trying to prove to my uneducated parents that it held real value. And I like the spinner. Great story to tell; fits the theme well and is engaging. Thanks, Charli. To me one of the saddest parts about where we are right now is that so many college graduates are overwhelmed by student loan debt and working in dead end jobs. We owe them a spin of the wheel than that. Yes, I’m living that “turn” on the game of life. The debt is heavy but I also know the value is priceless. Without an education, I never would have given my own children the opportunities they’ve had. I can always use my degree in many ways and college (liberal arts) taught me that I might not always know the answer but I can find it. And it gave me structure, confidence and a network for my writing. Let’s get that wheel spinning down a good road for our kids!